Paul Krugman discusses whether Japan has had two lost decades. This picture suggests that the Japanese economy was indeed depressed for about 16 years, and deeply so after the slump of the late 1990s. But it may have returned to more or less potential output on the eve of the current crisis. Just to be clear, this is not a picture of policy success; it is, in fact, a picture of enormous waste. But the condition wasn’t permanent. “Even by current grim international fiscal standards, Japan’s budget for the year from April 1 makes scary reading. I don’t intend to go down the “Japan’s bond market is about to collapse” path. But what I am wondering about is Krugman’s description of the condition as not permanent. Where does this leave me? Yes, fiscal policy can work – it can back fill missing demand. But we haven’t seen enough activity in Japan to really jump start the economy to a point that fiscal policy is no longer an economic necessity. And I am not sure we can expect such a jump start without more explicit help from the central bank. In which case, Japan has not truly “recovered.” Thus, we cannot yet conclude their condition is not permanent. In short, before we can declare recovery in Japan, we need to define what a successful recovery should look like. Is it just about returning to potential output (adjusted, in this case, for demographics), or should it be recovery to the point that deficit spending is no longer necessary to support that output? These are all good questions, and I basically agree with Duy’s post. However I’m going to quibble with one small point, the “yes fiscal policy can work–it can fill back missing demand.” Yes, fiscal policy CAN work in some very limited circumstances. But I’d argue that Japan is almost a textbook example of a situation where it CANNOT work, at least under the current policy regime. First a few stylized facts. Japan’s NGDP has hardly changed in 20 years. The GDP deflator has fallen about 1% per year, and RGDP has risen at about the same rate. The 1990s were clearly a lost decade, when Japan began falling further behind the US after rapidly catching up for many decades. Japanese unemployment never got very high, but that partly reflects all sorts of cultural and institutional differences with the US. Then things picked up a bit around 2003-07, before slowing again with the current recession. Some point to the fact that they’ve recently done as well as the US in per capita terms. But of course the past ten years have been something of a lost decade for the US as well. I’d like to step back and notice something astounding about Japan, the nearly flat NGDP over 2 decades. Yes, there’s been little population growth, and essentially no growth in the labor force. But it’s quite striking to see a major economy have no NGDP growth for 20 years, even in per capita terms. Indeed I can’t think of any other country that experienced this sort of nominal stagnation. This begs two questions. Why was NGDP so sluggish, and why was RGDP and unemployment not even worse, given the horrible performance of NGDP? In my view, the slow NGDP growth reflects a very flawed policy approach by the BOJ, which fiscal policy was not able to overcome. And the non-horrible (but very mediocre) performance of the real economy reflects the fact that Japan does have some wage and price flexibility. By no means perfect flexibility, but enough to keep unemployment at fairly low levels. People sometimes forget that it is NGDP, not RGDP, which tells us what’s going on with demand. 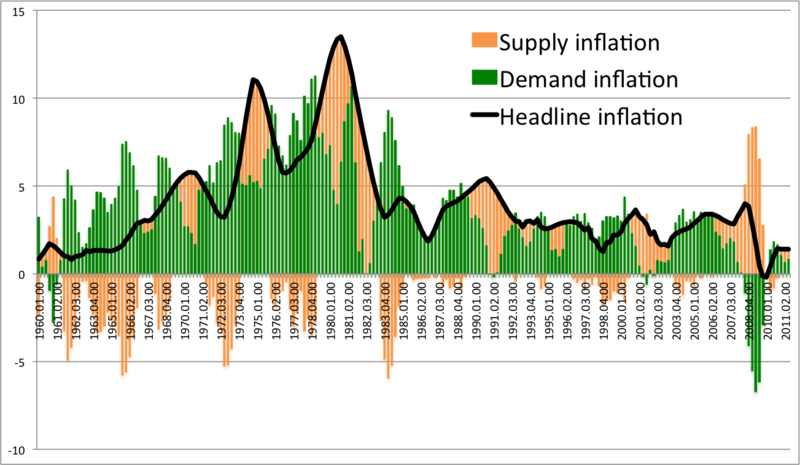 RGDP reflects the interaction of both supply and demand shocks. The RGDP per capita growth is low in Japan, but not off-the-charts low. NGDP growth is off-the-charts low. In a way I think this actually strengthens Duy’s argument. Japan has run up some pretty large debts, even if one uses the smaller net debt figures. And there is nothing to show for it except a world record lack of any movement in the AD curve for 20 years. Why is that? Not because fiscal stimulus can’t work. But rather because it can’t work if the central bank tightens every time it looks like the inflation rate might rise above zero. From this perspective fiscal stimulus seems almost beside the point. If the BOJ tightens (as they did in both 2000 and 2006) every time there is a possibility of even a tiny bit of inflation, then fiscal stimulus in Japan will probably fail. If the BOJ did allow even modestly higher inflation it might work, but in that case it probably wouldn’t even be needed, as higher inflation would (temporarily) lower both the real interest rate and the real exchange rate, boosting growth. On the other hand the stylized facts also suggest that AD is not Japan’s only problem. Remember that money is neutral in the long run. I think Japan’s deeper problem is productivity. I’m not surprised that Japan is poorer than the US in PPP terms, almost all developed countries are. Its per capita GDP is similar typical Western European countries like Britain and France. What surprises me is that the Japanese need to work many more hours than the French to achieve the same per capita income. I’d guess there are rigidities in the domestic economy, perhaps due to special interest groups/rent seeking/regulation, etc. For instance, do they have hypermarkets like the French, or do they rely on smaller shops? These sorts of policies can’t be fixed with more AD. 1. They need supply-side reforms. 2. Faster NGDP growth would help in two ways. First, it would make real wage flexibility slightly easy to achieve, as there is evidence (at least in the US) of a discontinuity of wage changes at zero percent. Second, slightly higher NGDP growth would move Japan above the zero rate bound, allowing the BOJ to do a better job cushioning the Japanese economy from an external demand shock like 2008. I really don’t see how fiscal policy can deliver either of these needed changes. Monetary policy determines trend NGDP growth, and the Japanese Diet is responsible for regulatory changes. Interestingly, it’s easier to see this from a distance. Very few American economists think that bigger Japanese deficits would solve their problems. Bernanke thought it was obvious that they needed easier money. However if I’m not mistaken the Japanese themselves don’t see it as being so obvious that easier money would help. And of course when the US suffered a severe aggregate demand shortfall, Bernanke no longer seemed to see monetary policy as either the cause or a “cure all.” At least that’s what he says publicly. Up close excessively tight money always looks like something else–usually one of its symptoms. PS. Japanese NGDP fell 0.3% between 1992 and 2010. I don’t have more recent data, so the “2 decades” statement was a slight exaggeration. The Economist estimates that 2012 RGDP will be 1.6% above 2010 levels. Nominal growth will probably be even less. This entry was posted on January 21st, 2012 and is filed under Misc., Monetary Policy. You can follow any responses to this entry through the RSS 2.0 feed. You can leave a response or Trackback from your own site. Some comments on a fascinating post. 1. Japan did try QE in the mid-2000s, and John Taylor gushed about the success of that program (in a paper on his website). Then Japan gave up on QE. So not all Japanese stimulative efforts were fiscal, and they had some arguable success with QE (an argument in favor of Market Monetarism). 2. Maybe Japan needs supply-side reforms, but that could be said of any modern nation. I find it hard to believe they flourished wildly, and then supply-side impediments shut the valve off in 1992. 3. Japan has almost no nominal GDP growth for roughly 20 years, while stock markets have tumbled 75 percent, and property market 80 percent. In addition, industrial output fell back 20 percent in this time frame, while USA industrial output doubled! Conclusion: If ever there was an example of what tight money does to a modern economy, look at Japan. It is an epic failure. Luckily for the Japanese, they have perhaps the world’s most advanced culture and had high living standards already by the time the Bank of Japan decided to suffocate the economy. The also allocate almost nothing to national defense (vs. 6-7 percent of GDP in the USA) and only 4 percent to health care (vs. 16 percent in the USA). They have a lot more disposable income as a result (some confuse this extra income with economic growth). The yen has appreciated against the dollar through this whole dismal and extended Bank of Japan experiment with stagnant paper currency values. Yet the benighted “inflation is theft” crowd stands in awe of the Bank of Japan. The tight-money crowd genuflects to hoary encrusted shibboleths extracted from debunked and misguided epistles. There is no virtue in zero inflation, or even moderate inflation, or moderate deflation. There is virtue in a monetary policy that assists real growth. That is called Market Monetarism. The rate of inflation is secondary to the responsibility to obtain robust real growth. Faster NGDP growth would also make the debt burden look less scary. Though, debt is not a burden as such (as long as you can service the debt, since it is just payments from taxpayers to bondholders), the higher the debt to be serviced the more other negatives can come into play. Just a thought – maybe the fiscal policy has helped/could have helped with the credit channel shock that has happened when the Japanese government has tightened the banking regulation by telling the banks that they are “zombies”. Highest avg. age, population is actually shrinking. And they live a long damn time. They buy their own debt – at least. But again, Japan’s hegemony is OLD PEOPLE and they have a vested in not having their savings inflated away. Please don’t write “begs the question” when you mean “raises the question” or “suggests the question”. Thanks! Lars Christensen had some interesting posts on this a while back. As Christensen and Krugman point out, looking at per capita data may be deceiving due to an aging demographic, better to look at per worker data. You can see there has been a significant improvement in Japan per worker GDP relative to Germany, France, and Italy since 1999. Scott, you’re surprised that the Japanese need to work many more hours than the French to achieve the same per capita income. I’m surprised the Germans have to work more hours than the Japanese to achieve the same. Scott, you touched on this with the comment “money is neutral in the long run”, but I think it needs a lot more attention. Isn’t money even approximately super-neutral in the long run? You’ve mentioned before you have not particular attraction to the 5% NGDP growth rate beyond the fact that it’s the historical rate for the US; at this point 0% NGDP growth is the historical trend for Japan. Any monetary story of their malaise has to address non-super-neutrality, rather than just non-neutrality of money. Your two hypotheses – the zero discontinuity for wages and the zero rate trap making them more vulnerable to real shocks – make sense, but the entire monetary story rests on them right now. Ben, Good points, although I can’t believe the 4% to health care is quite right–must be a bit higher. Lorenzo, Yes, I was going to mention that, but thought I’d already gone on too long. 123, Maybe. I’m not really qualified to offer an opinion on that. Morgan, All my commenters over here keep telling me that zero interest rates are bad for savers. I’d think they would want higher interest rates. Gordon, I’ll try to remember that, although I am both a bad writer, and someone with a bad memory for previous advice. JP, I have doubts about that data. Is that per worker or per hour. The Germans work very short hours. I seem to recall it’s something like 1350 hours a year vs 1800 in Japan, but that’s from memory so it might be off. Alex, Yes, I’d say that those are the two non-superneutralities in the long run. Or at least the only two I can see. For the US you can also make some ad hoc pragmatic arguments; such as my claim that easier money would lead to a quicker reversion to 26 week unemployment comp, and that would improve labor market efficieny. In Japan the bad monetary policy might have led to wasteful fiscal stimulus, which reduced RGDP over time. But you raise a very good question, and I don’t claim to have a definitive answer. The more debt Japan issues, the more powerful (and simultaneously vulnerable) the bond market becomes – do you think current bondholders would tolerate any increase in NGDP that would threaten to devalue their medium to long term bonds? Until/unless the risk of default rears its ugly head, the Japanese economy is one in which the non-productive asset holders forever hold the productive assetholders in an iron grip. It’s institutionalized peonage. With regard to supply side reforms, I continuously wonder how much of the supply side problems are entirely due to demand crisis. Labor market rigidity… is very much a REACTION to demand inadequacy. The yakuza have never been as powerful as they are now, largely because the population has no choice, and because mafia members have no other career options. The dependence of the economy on fiscal spending… a reaction to AD problems. 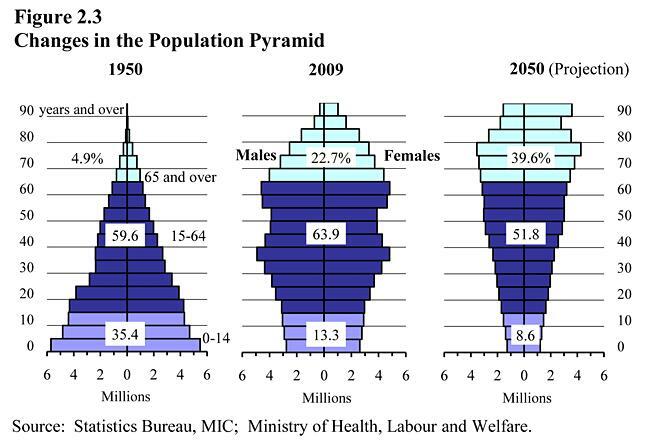 Japan is a tyranny of the pensioners – that is what an economy looks like when the old prey on the young. Data is GDP per person employed. If you have problems with the data, take it up with the World Bank. In the mid-2000s Americans could probably get a CD with 5% interest and inflation was 2.5%. Now you can get a CD with 0.5% interest and inflation is 1.5%. I don’t see how retirees are better off today with lower inflation. But you are roughly right, Germany is about 1400 hours per year, Japan is 1700. A while ago, Scott, you wrote (?p=12111) that the US during the 1920s had effectively zero NGDP growth. You even mentioned US NGDP growth during the ’20s was per capita worse than Japan’s. That seems to indicate that the ’20s Fed created effectively the same monetary conditions in the US as the BOJ has the last 20 years in Japan. So why didn’t the Fed’s tight money during the 1920s create a lost decade for the US, if the problem in Japan is monetary? Is it because people in the ’20s US expected constant NGDP? I’d guess there are rigidities in the domestic economy, perhaps due to special interest groups/rent seeking/regulation, etc. For instance, do they have hypermarkets like the French, or do they rely on smaller shops? Smaller shops mostly, at least from what I’ve read. Japan’s retail and services sectors are mostly very inefficient compared to the US (one of the interviews in Arnold Kling’s book mentioned that Retail Sector productivity there is something like one-third that of the US, or even less). It’s to the point where there’s almost a “two-tiered” economy, with a highly productive and efficient export sector, and a much less efficient, protectionist domestic sector. Korea has the same sort of thing going on as well, although they’ve been trying to open up some of the sectors traditionally covered by protectionism (such as retail). #1 As people age, they have on average less desire to “buy stuff” – partly because any one of us can only cope with a particular mental volume of “stuff”. One wonders if it can be shown that AD is suppressed by rising median age. Both Japan and Italy have structural issues (family owned businesses, desires to be small, etc.) The US of course has issues as well, but often of a different nature. #2 W.R.T. “excess reserves” (and whether the Fed should force them into circulation) – there are a number of voices arguing along a line from “they’re not actually excess” to “nobody including the banks can tell if they’re excess”. And at least one non-whack blogger who has suggested that while B of A is liquid, it may in some sense be insolvent. So one argument for encouraging “excess reserves” is that the party doing that would rather error to the high than to the low side. W Peden, The Guardian version of NGDP targeting seems to be pretty “evil”. By the way the main problem with Bank of England NGDP targeting is that the bank seem to be targeting a 5% GROWTH rate of NGDP rather than a particular LEVEL for NGDP. What the BoE is doing at the moment basically is discrediting both QE and NGDP targeting. But I guess this is not the place to have than particular discussing. Regarding Japan I have made my view clear in a number of posts on my blog. I think that the discussion about Japanese issues is extremely uninformed. It is hard to believe that the Japanese economists and politicians are so stupid and failed to counteract simple economic challenges. I would rather suggest that there are objective forces like the decreasing populaiton which influence the low growth rate of real GDP. In the US, the population is not going to decrease any time soon and the Japanese example is not instructive. However, the current decrease in the rate of participation in labor force does repeat that observed in Japan and will result in a deflation decade. #1. I don’t see how this can be seen as anything but a complete failure of so-called “fiscal stimulus”. If two decades of massive peacetime deficits leave the government faced with a deficit larger than tax revenue, that’s failure. To use horrible and broken “car” metaphor of the engine: it’s as if they simply pulled the engine, replaced it with manual pedals for the driver and told him “we fixed it!”. On the other hand, unemployment HAS stayed pretty low, and to be fair to keynesians, isn’t that usually the primary goal? They fact that you effective bankrupt the nation and socialize increasing amounts of its resources along the way is a secondary concern for them. #2. If 20 years of flat NGDP isn’t long enough for inflation expectations to have adjusted, well, how can they ever adjust? And since the unemployment did stay low, it seems to falsify the claim that you need NGDP growth at all. I’m with Hayek. Let productivity produce deflation and let money supply satisfy demand but growth no faster than it (aka flat NGDP). Japan seems to demonstrate that it won’t produce depression or high unemployment. #3. Couldn’t the failure of RGDP (adjusted for workforce size) to grow faster be the RESULT of the so-called “fiscal stimulus”? Seriously. Having the government spend trillions of yen on utterly useless boondoggles and bridges to nowhere is surely a negative productivity shock. It’s waste. And wasted potential resources in physical and human capital. Governments aren’t productivity producers. They’re vote buyers operating Ina world of planner ignorance and bad incentives. So one would expect that when a government spends this much money, productivity and thus real growth is going to stagnate. Hell, if growth did recover to pre-1990 levels, that would be a challenge to market advocates on who should plan for whom. #4. Scott, when do you believe fiscal stimulus can work? What is this scenario and is it plausible in the real world? Are you including deficit financed tax cuts as “stimulus”? Most keynesians from Krugman and Delong to Blinder and Baker, seem to think of tax cuts as the worst “stimulus”, despite Romer’s work suggesting that it’s the best. I don’t see how government spending could be stimulus insofar as they are subject to the knowledge and incentives problem. In theory, great “infrastructure” could help, but they’ve proven to be bad at that even during good times. Health care spending is 8>9% of GDP. Japan was subject to the large scale retail store law effectively preventing any large retailers (>500sqm) from opening anywhere except isolated areas – thus 50k+ convenience stores in Japan. Kio > low GDP growth leads to low population growth not the other way around. Lack of liquidity in the labor, capital and real estate markets. Stricter enforcement of tax laws raising effective tax rates. Shift from being able to do add_labor_growth (easy) to needing to do increase_productivity_growth (much harder)..
I’d guess the problem is about 70 to 80% systemic/supply side and maybe 20 to 30% monetary policy. Statsguy, Why then does Japan keep doing fiscal stimulus? Yes, and that’s exactly the wrong data to make the point you are trying to make. It’s also likely that wages in America during the 1920s were more flexible, but I don’t know for sure. Also, the US had much faster population and productivity growth, and hence the nominal interest rate never fell to zero. Brett, Thanks for that info. Retailing is a very large sector, if it’s grossly inefficient that will lower one’s GDP per working hour. Yes, but that doesn’t reduce AD, it just redirects it toward investment. However the old also have lower incomes, so they may actually reduce saving by more than they reduce consumption. There’s no debate about whether ERs are ERs. It’s easy to measure required reserves, and the rest are excess by definition. I think you are referring to the debate over whether they are desired reserves. I agree that if banks are holding ERs, then they desire to hold those ERs. Thanks W. Peden, I added an update to my newest post. Why is that hard to believe? Our economists and politicians failed to address the simple problem of falling NGDP in 2009. As I said, the big problem in Japan is NGDP, not RGDP. So the labor force explanation doesn’t really explain it. John, My sense is that the unemployment data is very misleading. If you read articles by people who really know Japan, you don’t get a sense that things went well in the 1990s. They talk about a lost generation of young people who couldn’t find jobs, or who just found lousy jobs in the informal sector. But I’m no expert, perhaps a commenter like dtoh can chime in. As I said in the post, I think they have adjusted. 4. I have a new post that discusses that. It can work if you cut the VAT or the employer-side payroll tax rate, while the central bank is inflation targeting. dtoh, Those are very useful comments. I’m particularly interested in your claim that low GDP growth slows population growth. That may be true, but population growth is also slow in Korea and Taiwan. I agree with all of your other comments. Any views on the unemployment issue discussed in my reply to John? The stats by dtoh also reminded me of what I’d read some years back, in that some high export economies like Japan needed those little shops to keep everyone happy. In a sense that works like a government employment subsidy, and it’s easy to see why Japan would rather keep the large retail stores out. Apparently ‘creative destruction’ can be a bit overwhelming in an economy limited both in size and by an older population. Begin with the following supposition: the primary goal of the current power structure in Japan is to preserve the purchasing power of those in power. In Japan, it’s pensioners and bondholders. – Japanese bond term structure is a matter of high politics. The parliament itself was debating over whether the maturity of reconstruction bonds should be 15-20 years, or 60 years! – Likewise, there’s enough exposure to short term debt that if the short term interest rate approached 2%, financing costs for rolling the debt would increase massively. On the flip side, so would tax revenues… But tax revenues would increase because employment (_real_ employment), nominal wages, and returns on productive investment would eventually increase. Who does this benefit? Clue ==> not the retirees or soon-to-be retirees. Your primary counter argument to this is Ockham’s razor… But I would argue the razor points to politics and not stupidity. 1) How can you explain how people have remained stupid for 20 years? That requires a complex explanation. 2) The political explanation could not be simpler – Japan’s policies benefit those in power. No conspiracy required. OK, let me go further – the Fed and the BoJ are government institutions. They are run by PEOPLE, not RULES, as we have clearly seen. – What would Stigler (the old stigler) say? – What would Milton Friedman say? – Do you think the fact the Fed and BoJ are run by people from your own profession somehow would at all change what Stigler or Friedman would say? Do you think that economists (especially those in finance and whose salaries are paid by govt institutions that regulate financial interests) are somehow the ONLY group on the planet that are immune to the dynamics that Stigler and Friedman describe? I don’t think there is much good empirical proof for the low gdp growth slows population growth argument, but anecdotally the reason I always hear why people don’t get married and have kids is the high cost of having children and the now very slim prospects for economic advancement. In old age parents used to depend on their children. In Japan, it’s now the other way around with a lot of people living off the wealth accumulated by their parents in the 40 years after the war. You hear enough anecdotes and it becomes a statistically significant sample. Very strong socialist mind set which results in a very progressive tax structure. Japan has proven that if you do this long enough, you can actually strangle the goose. Traditional business groups have a lot political power. Creative destruction is not a good thing for them. Most are corporate bureaucrats and on a fairly fixed compensation scheme. Thus they’re quite content with low NGDP growth, tight money, and no new competitors entering their markets. The BOJ is stupid and conservative. Pensioners have zip political clout. The shift from labor intensive businesses to capital intensive industries and how it was financed by the long term credit banks is an interesting story. The problem now is not the price of credit and capital, but it’s availability. The independent retailers were big contributors to the LDP. Thus the restriction on big stores. Lot of lip service to the importance of stability and tradition, but it was just yen talking. It all backfired though: most of the independents are gone and what’s left is a lot of convenience stores owned by big retail chains. I know what you mean by this, but if you think about it, the statement is logically inconsistent. I think a better way to phrase this is the cost of collateral – we need to decompose the risk/time component of credit cost. I also understand the kieretsu argument, but Korea has chaebols – arguably similar, yet different outcomes. Nice chart… I’d be interested in Scott’s opinion. StatGuy, thanks – I think my Quasi-Real Price Index can be very useful in analysis a number of monetary “events”. StatGuy, it should be mentioned the graph you linked to is on the US economy and not the Japanese economy. I have used the concept to write a couple of “stories” on modern US monetary history. Regarding credit, practically there is no risk component. Virtually all lending is heavily collateralized, or it’s government guaranteed in very small amounts, or it’s at usurious rate 15 to 20% pa.
It’s not really a keiretsu argument. It’s just that large corporations have a lot of political influence. On taxes, the charts aren’t right. With local and prefectural, the rates top 50% plus the social insurance premiums are very high. More importantly from the viewpoint of new business formation. Capital gains rates are substantially higher, there are no effective pass through corporate structures (e.g. LLC or S Corps), and incentive comp to directors (i.e. business owners and execs) is not tax-deductible. In practice Japan rates are very high. The comments here seem to have drifted from macroeconomics to microeconomics. Sticking to the microeconomics, of course a very old population will hate anything that smacks of creative detruction. Consequently potential output growth will always be low – perhaps even, in the extreme case, negative. Of course there is a hidden assumption in the discussion here that high output growth is always and everywhere welfare-maximising, whereas if you are an old person then wanting sclerotic institutions that look after you is perfectly rational. The big question really is whether such sclerosis is SUSTAINABLE rather than whether it is currently welfare-maximising. Which brings us back to macroeconomics, plus also questions of international power relations and also human ecology. That is an excellent series of posts… I hope that concept gains some traction, it certainly merits it. The currently assumed “exogenous” rate of productivity growth could certainly be estimated, as you note, and probably very simply since it’s highly likely to be a function of technology and highly serially correlated (a simple moving average with a few other exogenous variables like population age structure would go reasonably far). I’m struck by how closely that graph mirrors the various narratives throughout the last 4-5 decades. On the volker disinflation, the only thing that I’m somewhat unsure about is the degree to which expectations of future inflation can create supply inflation. I think this might have also happened in 2008 (spring/summer) with the commodity inflation. To the degree that inflation is expected, carry traders will hedge it using commodity inputs that could cause demand inflation to mask itself as supply inflation; there’s probably a way to separate that endogeneity. But to be honest, in a well-anchored and transparent NGDP level targeting system, this should go away as long as the system has credibility. More reason to have an NGDP level target. dtoh – I accept your point on local taxes, though the US and Germany have their share too, but I do not know this issue well and I suspect you are probably right. On collateral, that is exactly the issue. Demand for collateral (i.e. the rate difference between collateralized nad non-collateralized loans) is a direct measure of pricing of default risk. StatsGuy, the Quasi-Real Price Index (QPRI) do indeed track the narratives in US monetary modern history. The index is extremely simple to calculate. Furthermore, there might be an argument for advocating a 2% growth path for QRPI. This would be price level targeting for demand driven prices. This would effectively be exactly the same as a 5% NGDPLT assuming 3% trend growth in RGDP. By the way since PCE tracks NGDP pretty well one could easily calculate a monthly QPRI based on PCE. Can someone explain or point to a post where Scott explains the mechanism through which fiscal policy can affect velocity and therefore GDP? Is it through changes in interest rates or just a direct increase in transactions? Jim, I am not sure where Scott explains this, but I have an explanation here…http://marketmonetarist.com/2012/01/18/there-is-no-such-thing-as-fiscal-policy/ – I think Scott and I more or less agree on this. I too thought that Japan was doing a pretty good job with what they actually have to work with. However, I do not know the story of how this affects the younger generations in terms of moving forward (sustainability), and would appreciate any thoughts on that. Beg to differ. I would have to say it’s one of the worst cases of economic mismanagement in the history of the planet. If they fixed the rules, they could easily get sustainable 10% annual RGDP growth for a generation. No Scott. The point I was trying to make with that chart is that the relative recovery began in 1999. Finito. Becky, That might be right. Statsguy, But my point is slightly different. Can’t you get the same level of AD with a bit less fiscal and a bit more monetary, and do so without ballooning the deficit? BTW, I’m by no means convinced you are wrong, just trying to flesh out the argument. I’m confused by the second comment, as Friedman and Stigler famously disagreed on this issue. Stigler thought Friedman was a bit naive. dtoh, Then maybe the problem is that Korea, Taiwan, and Japan are all wealthy, crowded countries. Statsguy and Lars, I think Lars’ graph looks very plausible. I haven’t commented due to lack of time, but it seems right. On the other hand I don’t want to “fix” inflation, but completely replace it with NGDP growth. derrida, Yes, aging may be an issue in the Japanese stagnation. Jim, I was thinking of interest rates, but I think there are probably some other mechanisms as well, especially at the zero bound. Statsguy, I’ve met dtoh, he knows his stuff on Japan. So do you have hours data or not? I thought you conceded it wasn’t hours data, but rather GDP per person employed. In that case it doesn’t say anything about hourly productivity. Friedman argued for rules, not men, and Stigler basically argued that we’re hosed no matter what, but both agreed that regulatory boards were vulnerable to capture, the less transparent and more discretionary the more so. (Other institutional factors contribute as well.) The Fed is clearly not held to rules, has widespread discretion across a huge policy area (not just monetary, also regulatory and financial prudence), and is incredibly opaque by design. Of course, and overall it’s probably more efficient, but the distributional impact is different, with systemic consequences. 1. Who is the Malaysian(?) blogger who reads Scott Sumner and who posted this: http://economics-mind.blogspot.com/2012/01/further-evidence-against-recalcuation.html (it’s a good post). 2. It is impossible to write comments on that blog (at least, it won’t work for me). Scott, I am not trying to “fix” inflation – merely trying to illustrate the difference between good and bad deflation. Furthermore, my demand inflation measure do indeed capture all the major swing in monetary policy in the numerous countries I have studied with this method. Obvious “demand inflation” is basically just NGDP growth – trend RGDP growth. Statsguy, Yes, but it’s a little less opaque than two days ago. The distributional impact has nothing to do with fiscal vs. monetary, it has to do with whether fiscal should favor the rich or poor. Lars, Maybe my previous answer was poorly worded, as that’s what I was assuming you were trying to do. I want to convince people to stop paying ant attention to inflation.